What is it that we humans find so enticing about the experience of joining for a common purpose? I think it is that we have an opportunity to let down our defences a little, and in the process of doing just that, we are immediately closer to others. We are not so separate. It is in community activities that we get nearer to the truth that yoga proclaims: we are one. Okay, okay. For some of us this takes time. And, it’s never a foregone conclusion that we will connect, because we have been conditioned to be independent rather than interdependent. Yoga schools are places where we can come together and create community. Because the activity we’re engaged in is learning and growing, the spirit of our endeavours is generally open and curious – whether we’re learning about our anatomy, our minds, our feelings, our selves. I appreciate the opportunity I had on Sunday to meet a whole new community of yogis from the Port Stephens area who came to do a day of yoga – meditation, breath awareness, postures and philosophy. It’s the connection among the participants that makes a good workshop as much as the facilitator and her content. 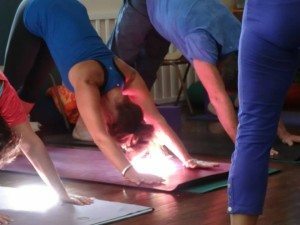 So, I’m also grateful to Nikki Schilling for the work she’s put in to grow her yoga community, and for her willingness to expand it to include me.